Though several celestial bodies influence the maternal instinct and one’s urge to nurture — the Moon and Ceres, for example — your mother’s Sun Sign reveals her essential identity, the way she expresses herself, her most basic drives, hopes and wishes. 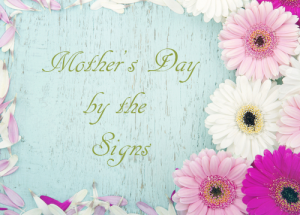 Look, then, to the Sun Sign of the maternal figures in your life to find out how to create the perfect Mother’s Day! You may feel tempted to pamper your mom on Mother’s Day or to give soothing, relaxing gifts like spa treatments or scented candles. But this Fire Sign mama’s going to be bored silly by all that bubbly, flowery stuff! Your Aries mother possesses boundless get-up-and-go — and she loves a good dare. She actually finds conflict exciting, which would explain some of your tiffs growing up. So don’t bother indulging her senses or offering her escape. Instead, challenge her to a day of power-shopping or, if she’s athletic, to an off-road bike ride. You’ll be surprised by her energy! Ideal Mother’s Day Gift: Your active Aries mother could really benefit from a gym membership. Present her with a gift certificate and a bundle of tiger lilies, which, with their vibrant spray of colors and dots, are like the Aries of the flower world. Your affectionate and protective Taurus mom has always worked hard to provide for you and to protect you; she needs a day off, and a Mother’s Day feast seems a pretty good excuse! Second to her love for her family is her love for rich, sumptuous food. A little sensory indulgence and your undivided attention should be enough to satisfy your mom’s penchant for pleasure. Take your time, order coffee and desserts and, if she tries to beat you to the bill, insist that the date’s on you. Ideal Mother’s Day Gift: If you can get your hands on a bouquet of tropical hibiscus, your Taurus mom will simply love them. Their soft, billowy petals appeal to her tactile nature. She’s also sentimental and will adore just about anything you give her — especially if it’s attractively wrapped. Your quick-witted Gemini mother’s always on to you and your schemes, so don’t bother trying to surprise her with fancy Mother’s Day plans unless you truly think you can outsmart her! Playful and chatty, your Air Sign mother would enjoy a cocktail party with all of her closest pals. But if you decide to make a toast to dear old mom, don’t go getting all sentimental on her. She doesn’t take herself or her emotions too seriously. Keep the mood fun and light! Ideal Mother’s Day Gift: If she’s the typical Gemini, your mother would love a bouquet of orchids, especially brightly colored ones. As far as gifts go, a Gemini can never have too many books! Find out if who her favorite author is and hunt around for an autographed copy or first edition. If your mom’s a Cancer, she’s probably the archetypal mother figure: Affectionate, loyal, nurturing, protective and emotionally available. On this special day, express to her how much she’s always meant to you; she thrives on your love and on knowing that she’s done her motherly duties well, after all. Make her dinner for a change and bring out all the old photo albums. Your generous time and care mixed with nostalgia and emotional conversation make for the ultimate Mother’s Day for a Cancer. Ideal Mother’s Day Gift: Your sentimental Water Sign mother will simply weep if you give her a lightweight silver bracelet of silhouette charms with her children’s names engraved upon them. Also, instead of plain flowers, bring her a bowl filled with floating water lilies. Your Leo mom possesses a fierce, abiding pride in her family, so the perfect Mother’s Day for this Lioness would be a gathering of her, well, pride. Bring together all her offspring and any other relatives you can contact, but be sure to make her the indisputable center of attention — while she’s a superstar without even trying, she still craves that spotlight. Regale the group with stories of all the wonderful things she’s done for the family. For kicks, rent a karaoke machine and toss Mom the mike! Ideal Mother’s Day Gift: Your Leo Mom perks up when handed a couple of sunflower blossoms — they’re big, bright and showy, just like her! Also, she cherishes the thought and effort of a card made by your very own hands. It reminds her of your drawings that she used to hang on the fridge. If your mom’s a Virgo, she probably cleans the house to relax, right? There’s something almost Zen-like about vacuuming the living room or trimming the hedges; the rhythm soothes her, not to mention the feeling she gets from bringing order to her immediate environment. Since shifts in her daily routine discomfort this modest mother, don’t throw a big surprise Mother’s Day party for her. She doesn’t like a fuss made on her behalf! Instead, take her out to a fine, well-appointed restaurant for lunch and offer her a neat bouquet of narcissus. And don’t be embarrassed if she reaches across the table to wipe that salad dressing off your chin! Ideal Mother’s Day Gift: Your Virgo mom will appreciate anything timesaving. So if you’re thinking smaller, go for a clean, new day planner. If you’re shooting for the *Stars* this year, buy her a new timesaving appliance, like that dishwasher she’s been wanting or a self-cleaning oven. Your sweetheart of a mom could double as a United Nations diplomat, the way she always ironed out your conflicts and soothed your fears. Her calm, even nature hid the truth: She spoiled you rotten! Take advantage of this yearly opportunity to spoil her right back. Your Libra mother dreams of being pampered, of being treated like absolute royalty, so treat her to a long, luxurious visit to a day spa. Pull out all the stops: We’re talking massage, manicure, pedicure, facial, mud bath and bodywrap. Ideal Mother’s Day Gift: Your mom’s a sentimental, romantic sap at heart, and she’d be so touched to receive roses from her beloved offspring. And though she likes luxury, she’s also a sucker for a heartfelt, homemade card. You and your Scorpio mom have always confided in one another. She’s more than just your mom; she’s your best friend, your teacher, your role model and your guardian angel all rolled up into one! This Mother’s Day is the perfect time to make that clear to her. Honor her with a quiet, cozy dinner with only the closest family members in attendance. Talking about old times — about how actions and decisions have made her feel, how the past has influenced her present — will make her feel appreciated and respected for the complex, multifaceted woman she is. Ideal Mother’s Day Gift: Your Scorpio mom’s nonconformist attitude likely extends to her taste in flora. So, rather than the usual carnations, opt for a spiky, oddly shaped cactus or a mysterious, alluring orchid; she respects a plant with an inherent element of danger! To honor your Sagittarian mom this Mother’s Day, nothing beats a weekend getaway. If you’ve got the time and the resources, go for a long drive or on an antiques run through small towns that are off the beaten path. The time you can spend together exploring the world around you will show your adventurous Sag mom that you really appreciate her energy and courage. If you don’t get a chance to travel, arrange a lively get-together with family and some of your mom’s many friends. She’ll jump at the chance to mingle and flirt with the crowd, showing off her smarts and humor. Ideal Mother’s Day Gift: Your Sagittarius mother adores strong, heady perfumes; seek out something based in the oil of hyssop. If she’s a traveler, surprise her with a portable CD player and a few discs by her favorite musician — music will help to wile away the hours on long flights! Your Capricorn mother takes the responsibilities of her role as your parent very seriously. She can sometimes play the martyr, doing for you kids before she ever does for herself. This Mother’s Day, pay tribute to her dedication by taking her to a restaurant she’s always really wanted to visit but felt was too pricey, even as a splurge. Realize that, to her, status is important; just knowing that you understand that will touch this hard-working lady’s heart more tenderly than any old homemade card. Ideal Mother’s Day Gift: Though mushy and sentimental when it counts, your Capricorn mom really appreciates a little extravagance — especially when it involves jewelry. A simple onyx ring or delicate tennis bracelet would suit her conservative but sophisticated tastes. If your mother is an Aquarius, she probably has a large circle of eccentric friends of whom she is very proud. She also involves herself in the world, extending her nurturing instinct outward. While her mothering style may be more global than most — and while she may have always seemed a bit different from your friends’ parents — she’s devoted and has always encouraged your independence. Now, to celebrate her unique and amazing soul, take her out for a lively dinner with you and some of her closest friends in attendance. The companionship and attention will make her day! Ideal Mother’s Day Gift: Though she’s an Air Sign, your Aquarius mom appreciates being grounded in reality. That said, she loves strange gifts, heartfelt surprises and anything that will enrich her soul and keep her keen mind centered. Give her a membership to a yoga school, and sign yourself up as well! Your good-hearted Pisces mama lives in a world all her own — and that’s the way she likes it! Fantasy and creativity are her lifeblood and on this special day, you should indulge her desire to daydream. Take her out to the theatre or to the ballet, anywhere in which reality is suspended for a time, allowing her to express her childlike innocence and curiosity. She’ll appreciate your understanding of her ethereal nature and you will get a glimpse of your mother truly enjoying herself. Ideal Mother’s Day Gift: The real world can sometimes be too much for this dreamy lady, so give her something calming and soothing that will provide her a bit of blessed escape. An aromatherapy diffuser and a combination of essential oils such as lavender and jasmine will definitely do the trick.